Today, I made "old clothes" or as my son refers to it "dirty clothes". 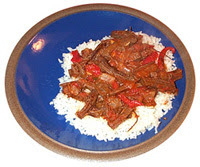 It is a traditional Cuban dish made with shredded meat, hence the term old clothes. I make mine a little different but the following recipe looks pretty traditional and I think you will enjoy it. Last night, I boiled potatoes, peeled them and sliced them in half. I served the ropa vieja over the potatoes. Traditionally, it is served with white rice.